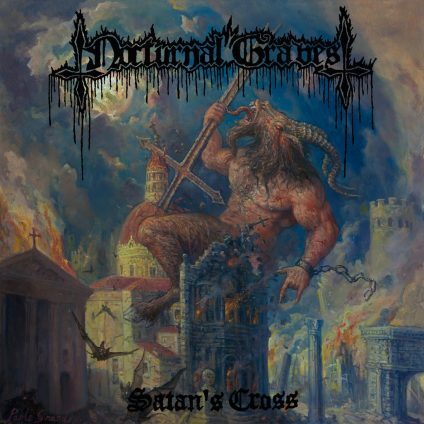 Part of the joy of being a metal blogger (there aren’t many but the ones that there are are pretty sweet) is being able to write a sentence such as “Australian death metal brutes Nocturnal Graves will re-release Satan’s Cross upon the unsuspecting peasant hordes.” I take my kicks where I can find ’em. The new edition of the album features cover art from renowned painter Paolo Girardi (BLACK BREATH, DIOCLETIAN, HIEROPHANT, and many more) and the album’s 5 track pre-production demos. The devil looks more ripped, I gotta say. He has been juicing. Pre order now so you will soon be juicin’ with Lucy yourself. The deluxe reissue of Satan’s Cross will be released on CD and a limited LP + 10″ mini LP set on December 8 Pre-orders for the album are available at the Season of Mist E-Shop. Nocturnal Graves stream "Silence The Martyrs"